Today I look at the AFC East. Sammy Watkins may have been the most explosive player in the draft. When he gets the ball in his hands, it’s special. Watkins has the ability to hit top speed in just one or two steps and once he gets into space, he is very elusive and hard to bring down. The addition of Watkins will make the Bills passing attack much more difficult to defend. With both Watkins and Marquise Goodwin, the Bills will have true speed at the receiver position. Watkins should be the starter on day one of camp and will team with Goodwin and Robert Woods to give quarterback EJ Manuel a true set of weapons. Cyrus Kouandjio is a massive (6’7” 322 pound) offensive tackle. He played on the left side for the Crimson Tide. Kouandjio was thought at one time to be possibly the best offensive tackle available in this draft, however, there was concern over his knees and he slid to the 2nd round. He should plug in as the opening day starter at right tackle and will pair with Cordy Glenn to give the Bills a set of talented bookend tackles for years to come. Preston Brown is an underrated inside linebacker. He is a physical, punishing linebacker that likes to attack the ball carrier and play downhill. Brown doesn’t have great speed, but he’s more fluid than most scouts give him credit for. He gives the Bills good depth behind starter Brandon Spikes and if he gets his opportunity, he could become a very good middle linebacker for the Bills. I really like Ross Cockrell. He has great instincts and ball skills. Cockrell has the versatility to cover outside or slot receivers. He will go into camp behind Leodis McKelvin, Stephon Gilmore, Nickell Robey and Corey Graham, but don’t be surprised if he doesn’t find a way to get on the field in nickel or dime situations. Cyril Richardson is a nasty run blocker. He was considered to be one of the top guards going into the 2013 season, but he put on weight and was not able to move as well as in prior seasons. Richardson looked really bad in the Senior Bowl, but then he lost the weight and had a good pro day. If he can keep the weight off, he is a steal in the 5th round. He will go into camp as a backup to starters Chris Williams and Kraig Urbik. Randell Johnson is a raw, athletic linebacker. He plays better when he is allowed to run to the ball and use his speed and athleticism. Johnson will go into training camp backing up Nigel Bradham on the weak side. Seantrel Henderson is another massive tackle. He has first round talent, but because of concerns over off the field issues, he almost wasn’t drafted. Henderson has the size and the arm length that you want out of a left tackle, but he will need to mature if he is going to make it in the NFL. Henderson goes into camp with Glenn, Kouandjio, Chris Hairston and Erik Pears ahead of him on the depth chart. If he shows to be coachable in camp, I can see him making the opening day roster simply because of his athletic talent. The Dolphins needed offensive line help in the worst way. After the Jonathan Martin – Richie Incognito debacle of 2013, the team now needs to rebuild their offensive line. I knew that Ja’Wuan James draft stock was improving, but I never thought he would be chosen in the 1st round. Apparently the Dolphins liked James better than Joel Bitonio or Cyrus Kouandjio. Although James played right tackle for the Vols, most scouts thought he was a better prospect than Antonio Richardson who played left tackle. The Dolphins added Branden Albert to play left tackle, so James should be the day one starter at right tackle. I really like Jarvis Landry. Some scouts have compared him to former Steeler Hines Ward. Landry is a tough receiver that knows how to get inside position on defenders and he’s not afraid to get physical in the running game. Landry doesn’t have great speed, but he has outstanding hands and his route running is very crisp. Landry will go into camp behind Brian Hartline, Mike Wallace and Brandon Gibson. He shouldn’t have any problems making the roster. Billy Turner was an All-American left tackle for the two-time FCS champion Buffaloes. He seems to be a better fit as a guard. Turner has good hand strength and is light on his feet. He will go into camp as the backup to starters Dallas Thomas and Shelley Smith. Walt Aikens has the size (6’1”) that everyone looks for in a corner and he ran a sub 4.50 40 yard dash at this pro day. He is a physical player that led his team in tackles his senior season. Aikens thrives in press coverage and also has some experience as the gunner on punt coverage. Assuming the Dolphins keep five corners, he should make the team behind Brent Grimes, Cortland Finnegan, Will Davis and Jamar Taylor. Arthur Lynch is a throw back to the old school tight ends. He is more of an in-line player that blocks well and can make short – intermediate catches. Lynch may have a hard time making the opening day roster since he goes into camp behind Charles Clay, Michael Egnew and Dion Sims. I see Lynch as probably a candidate for the practice squad. Jordan Tripp is an athletic, high effort player that runs sideline to sideline. He is a fluid athlete that stood out at the NFL Combine. Tripp seems to be a natural for the weak side and he goes into camp behind Philip Wheeler and Jelani Jenkins. Tripp may be borderline on whether or not he makes the opening day roster, but if I were the Dolphins, I’m not sure I would risk releasing him to put him on the practice squad. Matt Hazel is a receiver that is known for making difficult catches. He is a long strider that runs smooth routes. Hazel is a steal in the 6th round. He goes into camp behind Hartline, Wallace, Gibson, Landry, Armon Binns and Rishard Matthews, but don’t be surprised if he makes the opening day roster. Terrence Fede has good size and strength. Fede is very raw coming from a very small school and it may be tough for him to make the 53 man roster. He goes into training camp behind Cameron Wake, Olivier Vernon, Derrick Shelby and Tevin Mims on the depth chart. Fede is likely a candidate for the practice squad. Dominique Easley would have been picked much earlier if not for rupturing his ACL in September (his second ACL injury). He only played 3 games in 2013. When healthy, he is quick off the ball and very disruptive. Easley is a versatile player that has played both end and tackle for the Gators. He goes into camp competing with Joe Vellano for the top backup position behind starters Vince Wilfork and Tommy Kelly. Wilfork and Kelly are both over 33 so, Easley has a chance to become a contributor quickly if he can stay healthy. The Jimmy Garoppolo pick was a head scratcher. Most people thought Garoppolo would go in the 2nd round, but no one thought New England would be his landing spot. Unless Tom Brady gets hurt, Garoppolo won’t see the field during the regular season. The Patriots also have Ryan Mallett. There were rumors that the Patriots might trade Mallett to the Houston Texans before the draft. I would really like to have been a fly on the wall to hear the logic behind this pick. I think Garoppolo has a chance to be really good, but I wonder where he and Mallett fit in. My guess is that Brady, Mallett and Garoppolo will all make the 53 man roster unless the Patriots can find someone to trade for Mallett. Bryan Stork is a versatile lineman that can play center or guard, with his best position likely center. Stork is strong at the point of attack and does well against big bodied, run stuffing nose tackles. However, Stork was a tight end when he came to Florida State, so he has good athleticism to get to the next level and block linebackers. Stork shouldn’t have a problem making the opening day roster since he goes into camp as the backup to starting center Ryan Wendell. James White was never the sole running back for the Badgers, but he gained more than 700 yards every year of his career and he had more than 1,400 last year. I was a little surprised at White’s 40 speed of 4.57. He plays faster than that and gets a lot of break away runs. The Patriots use a lot of 2 back sets, so White should be able to get onto the field, especially if Stevan Ridley has fumble issues again this year. White goes into training camp behind starters Ridley and Shane Vereen and backups Brandon Bolden and James Develin. I don’t see any reason why he couldn’t move up to second string behind one of the starters. Cameron Fleming is a big bodied tackle that lacks the athleticism to play left tackle. He has a big body and strong hands, but speed rushers can give him issues. Fleming will have to play right tackle or maybe even kick inside to guard. Going into training camp, Fleming has starters Nate Solder and Sebastian Vollmer ahead of him, along with backups Jordan Devey and Marcus Cannon. Fleming will have to beat out at least one of the backups to secure a spot on the opening day roster. Jon Halapio is a tough player that gets by on his effort. His physical skills don’t blow you away, in fact, his 21 ½” vertical jump was the worst of all the offensive linemen. If the Patriots decide to use Stork as a backup at both center and guard then Halapio is probably headed for the practice squad, however, he goes into camp as a backup to starters Logan Mankins and Dan Connolly. Personally, I think Halapio will scrap and claw his way onto the 53 man roster. Zach Moore is a height-weight-speed specimen, but he is very raw having played at a Division II school. Moore had a very good Combine, finishing with the 4th best broad jump (10’ 3”) and he ran a 4.84 40 yard dash. Moore should have time to develop since he has Rob Ninkovich, Chandler Jones, Jake Bequette and Will Smith in front of him on the depth chart. It may be hard for Moore to make the opening day roster, but he should be a shoo in for the practice squad. Jemea Thomas is a very underrated defensive back that I really like. He has played both safety and corner for the Yellow Jackets. Thomas led his team with 88 tackles in 2013 and had 86 in 2012. He is not afraid to throw his body around and he flies to the ball. Thomas also has experience returning punts and kicks. I think Belichick will love this guy. Going into training camp, Thomas is the 4th free safety, behind Devin McCourty, Tavon Wilson and Nate Ebner. He may have a tough time making the opening day roster, but he could be stashed on the practice squad and allowed time to develop into a very good player in the future for the Patriots. Jeremy Gallon is the prototype of what you look for in a slot receiver. He has quick feet, runs good routes and snatches the ball from the air. Gallon does a good job tracking the ball on deep routes. He will likely be a candidate for the practice squad since he has Danny Amendola, Julian Edelman, Kenbrell Thompkins, Aaron Dobson, Brandon LaFell and Josh Boyce ahead of him on the depth chart. Calvin Pryor is a player that instantly makes the Jets a much tougher defense. Pryor will flat out knock your head off and he will set a tone of toughness for the team. Some scouts have him strictly as a strong safety playing in the box, but he has better range than most people give him credit for. Pryor should be the day one starter at safety alongside Antonio Allen. Jace Amaro is a wide receiver in a tight end’s body. Amaro had 106 catches in 2013, playing as a combo tight end/slot receiver. He can line up all over the field. Amaro goes into camp behind Jeff Cumberland, but Cumberland has never caught more than 29 balls in his career. I imagine the Jets will use quite a bit of 12 personnel (1 running back, 2 tight ends) with Cumberland as the blocking tight end and Amaro used to go into motion and line up in the slot. Dexter McDougle was a little bit of a surprise in the 3rd round. Not many people had him rated that high, mainly because he only played three games in 2013 due to a shoulder injury. The Jets obviously thought he fit into what they want to do defensively. McDougle will go into camp behind Dee Milliner, Dimitri Patterson, Kyle Wilson and Darrin Walls on the depth chart. If he’s healthy, he should be able to make the 53 man roster. Jalen Saunders is a small, quick slot receiver. His specialty is making the underneath catches then getting additional yardage. He has very good feet and is a big play threat after the catch. Saunders will go into camp behind Stephen Hill, Eric Decker, David Nelson and Jeremy Kerley on the depth chart, but I don’t think he will have a problem making the opening day roster. The Jets are really hurting at receiver and that’s they drafted Saunders and Shaq Evans back to back. Evans is extremely quick off the line, his 10-yard split of 1.47 seconds was the fastest of anyone at the combine. Evans doesn’t have great deep speed, but he should have no problem getting separation. Evans underachieved at UCLA, so it will be interesting to see what he does with NFL coaching. Evans will have to beat out one of the veteran receivers to make the roster. You have to wonder if the Jets may give up on the Stephen Hill experiment and go with the two young receivers. Dakota Dozier is a small school left tackle that is better suited to move inside to guard. Dozier has a tough, nasty disposition that will serve him well as a guard at the next level. Dozier will go into camp behind starters Brian Winters and Willie Colon and backups William Campbell and Oday Aboushi. I wouldn’t be surprised if Dozier didn’t make his way onto the opening day roster. Jeremiah George is an undersized inside linebacker. He is better in a scheme that allows him to run to the ball. Due to his size, teams can run the ball right at him. George will go into camp behind David Harris, Demario Davis, Troy Davis and Nick Bellore on the depth chart. My gut feeling is he will probably be on the practice squad where he can be allowed to bulk up a little. Brandon Dixon is a small school corner that gets in and out his backpedal smoothly. He has quick feet and he drives well on the ball. Dixon is a likely candidate for the practice squad since he is going into training camp as the 5th string corner. He will have to make a big impression to make the roster. Quincy Enunwa is a big receiver with decent speed. Enunwa had 12 touchdowns for the Cornhuskers in 2013. His size and long arms make him tough to defend in the red zone. Enunwa will be fighting a numbers battle to make the roster since he was the third receiver drafted by the Jets. IK Enemkpali was a defensive end in college, but will be called on to move to outside linebacker in the Jets 3-4 system. Enemkpali will likely go to the practice squad to give him time to learn the position. He will go into camp behind Quinton Coples, Calvin Pace, Jermaine Cunningham, Garrett McIntyre, Tim Fugger and Antwan Barnes on the depth chart. Tajh Boyd had an extremely productive career at Clemson. Some thought Boyd might contend of the Heisman in 2013. Boyd doesn’t have the size that NFL team’s like in a quarterback, but he moves around extremely well and when he’s in a rhythm, he’s tough to defend. Boyd will be given time to develop since they already have Geno Smith, Michael Vick and Matt Simms on the roster. Trevor Reilly is a versatile player that played both defensive end and linebacker. He is a strong, quick player with a high motor. Reilly a great feel for the game, but he will be up against the same numbers situation that Enemkpali has at the outside linebacker position. Next Wednesday, I will be posting my analysis on the AFC North. If you like what you read, please like us on Facebook and recommend us to your friends. 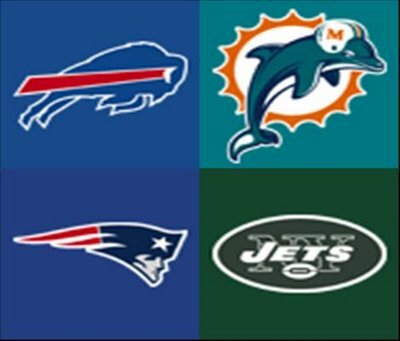 This entry was posted on July 9, 2014 by draftmaniacs in Draft Analysis and tagged 2014 NFL draft, AFC East draft, Buffalo Bills draft, Cyrus Kouandjio, Dominique Easley, Ja'Wuan James, Jarvis landry, Jeremy Gallon, Jimmy Garoppolo, Miami Dolphins draft, New England Patriots draft, New York Jets draft, NFL, NFL Draft, Sammy Watkins.